Need a quiet place to study or work with friends? 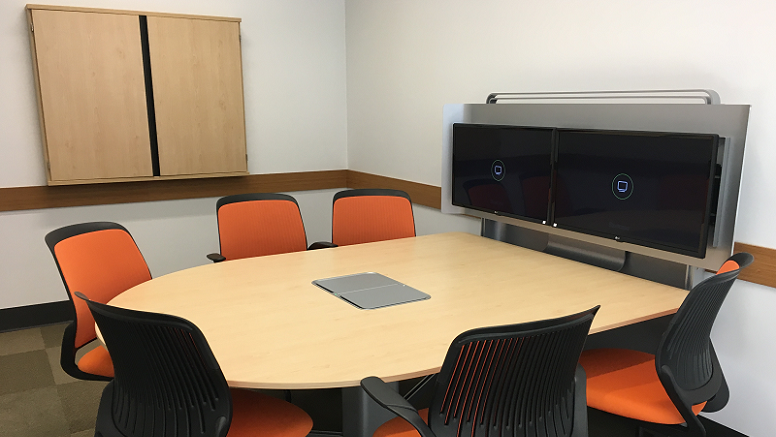 Our study rooms are a great option. The Main Library has 2 study rooms on the first floor and 3 on the second floor. Rooms are free and open to all ages. For use by 1 to 6 people per room. Staff can extend reservation in 1-hour increments if no one is waiting. Beverages with lids are okay in study rooms; no food, please. Each room has a whiteboard with whiteboard markers and eraser. Our study rooms are in high demand so please arrive on time for your reservation. Sign up online using our online reservation system. Our study rooms are in high demand, so please arrive on-time for your reservation. Reservation is considered forfeit 15 minutes after start time. The power button is located on the media well at the center of the table. If the light is Green the table is active, if it is white press the power button and the table will activate. Laptops, tablets, and other devices can be connected to the media:scape tables using any of the provided pucks; A connection diagram can be found on the inside flap of the media well. Our staff are happy to assist at any time. Connect the puck to your laptop. The puck should light up with the numbers 1 and 2 as well as the word "Off" in the center. Share what's on your laptop or device by pressing the number that corresponds with the screen you'd like to use. You can present to one or both screens at the same time. To disconnect your device, press the off button and disconnect the puck. Still no image? Check your laptop display settings and make sure it's either set to "duplicate display" or "projector only" or "mirroring" as some laptops may not automatically adjust these settings. In the display settings for your computer, set the resolution to 1366 x 768 or lower.